The book’s cover with view of the brick pathway through the garden and church of St. Peter’s dating from the 12th century. This and all accompanying photos from Virginia Woolf’s Garden: The Story of the Garden at Monk’s House by Caroline Zoob. Photography by Caroline Arber. Courtesy of the publisher, Jacqui Small. “Virginia Woolf’s Garden” is a wonderful read for gardeners and those who admire Woolf’s literary accomplishments. GV Contributor Joyce Newman has a conversation with its author, Caroline Zoob. Monk’s House in the village of Rodmell in Sussex, England, was Woolf’s country retreat from 1919 until her death in 1941. It is here that she wrote most of her major novels, drawing inspiration from the lush foliage and beckoning brick pathways weaving through various garden rooms: a terrace with millstones, a fishpond garden, an Italian Garden, a walled garden and an orchard—all created from an overgrown three-quarter acre lot behind a small house with an old tool shed, which became her writing room. 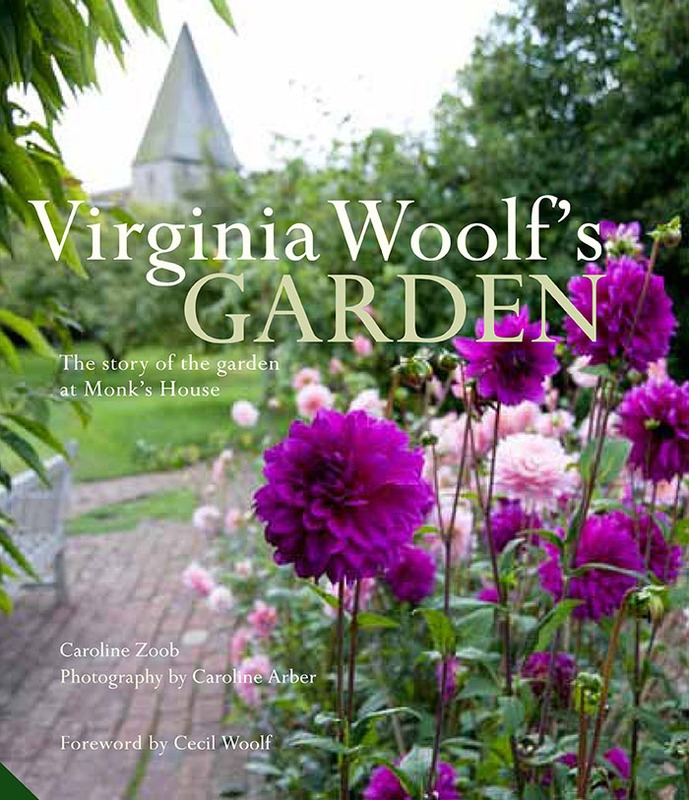 Caroline Zoob’s latest book, Virginia Woolf’s Garden: The Story of the Garden at Monk’s House ($50, Jacqui Small), tells the story behind this delightful informal garden. As tenants of the National Trust, Zoob and her husband lived in Monk’s House for more than a decade, planting and tending the gardens, looking after the buildings and opening the house and grounds to the paying public. Zoob’s intimate familiarity with the property and understanding of what it feels like to be there for an extended period gives her a unique perspective on what life must have been like for Woolf. Through her insights, carefully captioned archive photos and revealing quotes from Woolf’s writings, Zoob deeply conveys a sense of place while recreating the Woolfs’ lives and offering a window into their loving relationship. Add to the fact that she worked closely with friend and photographer Caroline Arber, who visited the house and garden many times during their 10-year stay—beautifully capturing its flowers, charming interiors and architectural details in full-color images in the process—and the result is a book that is truly special. 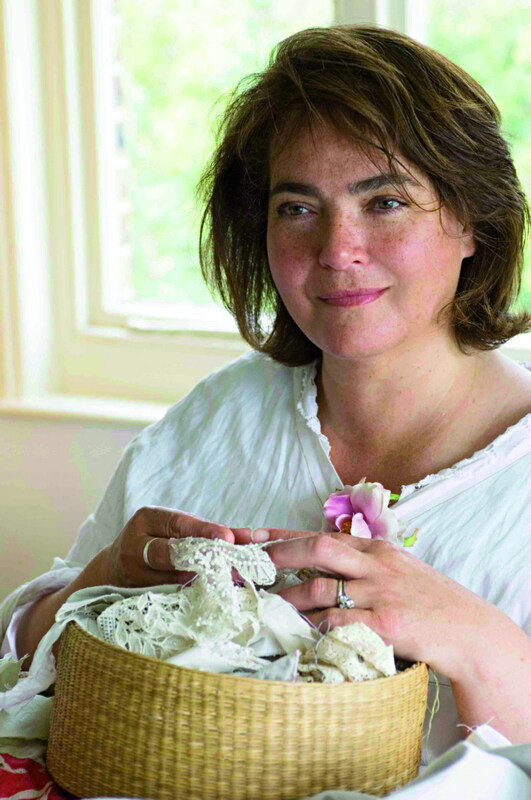 Headshot of author Caroline Zoob, who runs a home accents and hand-embroidered antique textiles shop. Q. 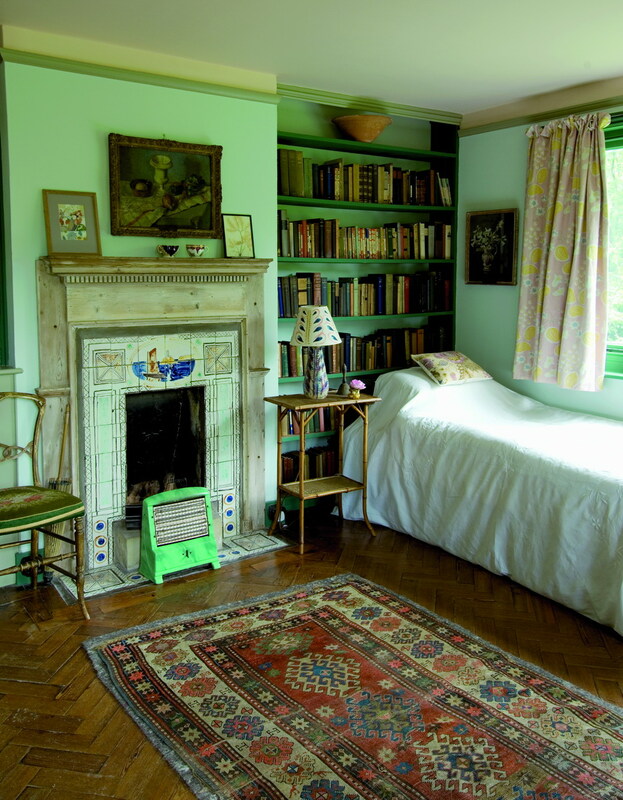 Were you a fan of Virginia Woolf’s books before you came to Monk’s House? A. When we moved to Monk’s House I had read only one novel by Virginia Woolf and knew nothing about Leonard. We took the lease because we fell in love with the garden. We learned about the Woolfs over the years and we researched the garden. For me, the best part of Virginia is the person we find in her diaries and letters. Q. In what ways did living there actually change you or both you and your husband? A. It turned us into serious gardeners. We were amateurs with a tiny back garden. Over the years, we learned many tricks for managing a garden open to the public twice a week. There was a sense of purpose in looking after the house and garden, and sharing it with the visitors. Q. What were you trying to achieve with the book? A. Leaving Monk’s House behind was very hard after a decade. So the book was a way of wrapping it all up in a parcel, tying the knot and moving on. I also wanted people to know about the garden and even more, about the relationship between Leonard and Virginia and the way they lived their lives at Monk’s House. Q. What are some myths and misconceptions about Virginia Woolf that you discovered while living there? A. There’s the myth that Virginia was this serious, depressed, mad person as portrayed for instance in the film The Hours. She had periods of illness. She was intense about her work. In between she was funny, she liked to cook and eat good food (tiny bites of it), bake bread, make honey, browse in antiques shops, wonder what colors to paint her house, muse about wearing red lipstick and she adored driving around in her motor car looking at houses. Q. Was the book fun to write? How long did it take you? A. It was fun to sort out all the information that we acquired over 10 years and to work out how to structure the book. We decided to introduce the garden rooms so that they appear in order of their creation. This dovetails with the biographical details about the Woolfs. Because I used Virginia’s diaries and letters as my main source while writing I had three very intense months with Virginia—and possibly found another aspect of her life to write about. Q. Did you do all the archival photo research yourself? They are such wonderful images, as are the recent photographs. A. Yes. Some of the images are very well known, but many are not and in fact most are available online through the Monk’s House albums. It was very satisfying to be able to recognize, even in very blurry images, the corners of the garden. 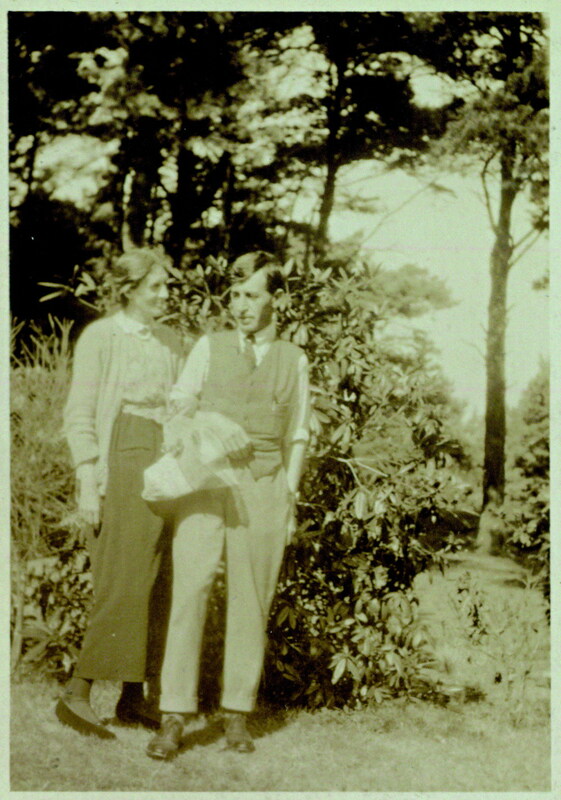 I was particularly pleased to find the photograph taken by Maynard Keynes of Leonard and Virginia…it is so tender and affectionate. The author’s favorite photo of Leonard and Virginia Woolf in the garden. By permission the Keynes family. Virginia Woolf’s bedroom at Monk’s House. Tiled fireplace with lighthouse and boat drawings by Vanessa Bell, her sister. This entry was posted in Book Reviews, Uncategorized and tagged antique textiles, British, England, English garden, garden, gardening, history, Joyce H. Newman, Leonard Woolf, Monk's House, Virginia Woolf, Virginia Woolf’s Garden. Bookmark the permalink.